EP Family Corp. FP-034-1 - Protect against dirt. Suggest replace with cabin Air Filter CP134 CF10134. Improve fuel millage, Recommended replacement every 12, 000 miles. Compatible auto models: Honda: Odyssey 2011-2017. Honda compatible model and year list: odyssey 2011-2017 cross reference: honda: 17220-rv0-a00 beck/arnley: 042-1818 carquest: 83009 champ: af5196 hastings: af1464 k & n: 33-2461 luber-finer: af5196 microgard: mga49009 napa: 9009 premium guard: pa6153 promotive: af6153 purepro: af5196 puroLATOR: A26153 VALVOLINE: VA-291 WIX: 49009 Helps extend performance. Replacement for fram ca11042, replacement Honda Genuine Part # 17220-RV0-A00 . EPAuto AUTO-CF-006 - Epauto cabin air filter cp134 compatible model and year list: acura: csx 2007-2011, cr-v 2007-2016, ridgeline 2006-2018 cross reference: honda: 80292-sda-a01, ilx 2013-2018, 80292-sec-a01, 80292-tz5-a41 fram: cf10134 ac-delco: cf159 baldwin: pa4196 beck/arnley: 042-2019 042-2023 bosch: p3875 champ: caf1781 defense: dc058 delphi: 16458329 g k industries: cf1047 hastings: af1244, tlx 2015-2018, rl 2005-2012, mdx gas 2007-2018, odyssey 2005-2017, rlx 2014-2018, tsx 2004-2014, pilot 2009-2018, 80292-sdc-a01, tl 2004-2014, civic 2006-2015, accord crosstour 2010-2011, 80292-shj-a41, zdx 2010-2013 honda: accord 2003-2018, 80292-t0g-a01, croostour 2012-2015, 80292-swa-a01, rdx 2007-2018, afc1244 intercontinental auto parts: alc-5302/1 kleener : caf1781 luber-finer: caf1781 napa: 4815 parts master: 94815 pronto: PC-5519 PUROLATOR: C35519 SERVICE PRO: MC35519 STP: CAF1781 WIX: 24815 Epauto cp134 cf10134 honda & acura replacement Premium Cabin Air Filter includes Activated Carbon. Clean air for driver and passengers, contains soda and carbon to generate fresh breeze air. Enhanced hvac performance, Recommended replacement every 12 months or 12, 000 miles. Check for filter replacement if a musty odor emits from the vehicles ventilating system. Recommended replacement every 12 months or 12, 000 miles. CP134 CF10134 Honda & Acura Replacement Premium Cabin Air Filter includes Activated Carbon - Check for filter replacement if the vehicles heating & air conditioning systems exhibits poor performance or efficiency. Replacement for fram cf10134, 80292-swa-a01, 80292-sec-a01, 80292-sdc-a01, 80292-shj-a41, honda genuine part # 80292-sda-a01, 80292-t0g-a01, 80292-TZ5-A41. Compatible auto list: acura: csx 2007-2011, croostour 2012-2015, pilot 2009-2018, tsx 2004-2014, rdx 2007-2018, ilx 2013-2018, accord crosstour 2010-2011, rlx 2014-2018, odyssey 2005-2017, tlx 2015-2018, cr-v 2007-2016, rl 2005-2012, civic 2006-2015, mdx gas 2007-2018, tl 2004-2014, ZDX 2010-2013; HONDA: Accord 2003-2018, Ridgeline 2006-2018. EPAuto FC-011-3 - Epauto cabin air filter cp134 compatible model and year list: acura: csx 2007-2011, 80292-sdc-a01, tlx 2015-2018, accord crosstour 2010-2011, 80292-sec-a01, ridgeline 2006-2018 cross reference: honda: 80292-sda-a01, mdx gas 2007-2018, ilx 2013-2018, zdx 2010-2013 honda: accord 2003-2018, rl 2005-2012, odyssey 2005-2017, 80292-t0g-a01, rdx 2007-2018, 80292-tz5-a41 fram: cf10134 ac-delco: cf159 baldwin: pa4196 beck/arnley: 042-2019 042-2023 bosch: p3875 champ: caf1781 defense: dc058 delphi: 16458329 g k industries: cf1047 hastings: af1244, tl 2004-2014, pilot 2009-2018, cr-v 2007-2016, rlx 2014-2018, croostour 2012-2015, civic 2006-2015, 80292-swa-a01, 80292-shj-a41, tsx 2004-2014, afc1244 intercontinental auto parts: alc-5302/1 kleener : caf1781 luber-finer: caf1781 napa: 4815 parts master: 94815 pronto: PC-5519 PUROLATOR: C35519 SERVICE PRO: MC35519 STP: CAF1781 WIX: 24815 Epauto cp134 cf10134 honda & acura replacement Premium Cabin Air Filter includes Activated Carbon. Clean air for driver and passengers, contains soda and carbon to generate fresh breeze air. Enhanced hvac performance, Recommended replacement every 12 months or 12, 000 miles. Epauto cabin air filter provides clean air for driver and passengers, contains soda and carbon to generate fresh breeze air. Recommended replacement every 12 months or 12, 000 miles. EPAuto CP134 CF10134 Replacement for Honda & Acura Premium Cabin Air Filter includes Activated Carbon - 2 Pack - Enhanced hvac performance, Recommended replacement every 12 months or 12, 000 miles. Replacement for fram cf10134, 80292-t0g-a01, 80292-sec-a01, 80292-sdc-a01, 80292-swa-a01, honda genuine part # 80292-sda-a01, 80292-shj-a41, 80292-TZ5-A41. Ecogard XC35519 - Replaces: fram cf10134 purolator c35519 wix 24815 OE 80292-SDA-A01. Replace per manufacturer recommendations or when existing cabin air filter inhibits airflow. Installs easily with included instructions - only takes a few minutes in most cars. Replacement for fram cf10134, 80292-sec-a01, honda genuine part # 80292-sda-a01, 80292-swa-a01, 80292-sdc-a01, 80292-shj-a41, 80292-t0g-a01, 80292-TZ5-A41. Compatible auto list: acura: csx 2007-2011, pilot 2009-2018, croostour 2012-2015, tlx 2015-2018, accord crosstour 2010-2011, cr-v 2007-2016, zdx 2010-2013; honda: accord 2003-2018, civic 2006-2015, rl 2005-2012, tsx 2004-2014, rlx 2014-2018, rdx 2007-2018, mdx gas 2007-2018, ilx 2013-2018, odyssey 2005-2017, tl 2004-2014, Ridgeline 2006-2018. ECOGARD XC35519 Premium Cabin Air Filter Fits Honda Accord, Civic, CR-V, Odyssey, Pilot / Acura MDX, TL, TSX, RDX / Honda Ridgeline / Acura TLX, ILX / Honda Crosstour / Acura RL - Clean air for driver and passengers, contains soda and carbon to generate fresh breeze air. Installations, depending on your vehicle, can take as little as five minutes. Car manufacturers recommend changing your cabin air filter every 12, 000-15, 000 miles. Ensure fit using ECOGARD's online catalog. Specifically engineered and tested for honda, acura oe original equipment cabin air filter's fit, form, and function. Do you have a musty odor in your vehicle? Do you have allergies? Is your vehicle exposed to a large amount of road dust? Try changing your cabin air filter. If your vehicle is exposed to a considerable amount of road debris, ECOGARD recommends changing your cabin air filter once in the Spring and Winter. EPAuto FC-011-1 - Recommended replacement every 12 months or 12, 000 miles. Ensure fit using ECOGARD's online catalog. Specifically engineered and tested for honda, form, acura oe original equipment cabin air filter's fit, and function. Clean air for driver and passengers, contains soda and carbon to generate fresh breeze air. Replaces: fram cf10134 purolator c35519 wix 24815 OE 80292-SDA-A01. Epauto cabin air filter provides clean air for driver and passengers, contains soda and carbon to generate fresh breeze air. Check for filter replacement if a musty odor emits from the vehicles ventilating system. Enhanced hvac performance, Recommended replacement every 12 months or 12, 000 miles. 3 Pack - EPAuto CP134 CF10134 Replacement for Honda & Acura Premium Cabin Air Filter includes Activated Carbon - Replacement for fram cf10134, 80292-shj-a41, 80292-sdc-a01, honda genuine part # 80292-sda-a01, 80292-swa-a01, 80292-t0g-a01, 80292-SEC-A01, 80292-TZ5-A41. Compatible auto list: acura: csx 2007-2011, accord crosstour 2010-2011, odyssey 2005-2017, rl 2005-2012, tl 2004-2014, ilx 2013-2018, rlx 2014-2018, croostour 2012-2015, tlx 2015-2018, tsx 2004-2014, mdx gas 2007-2018, zdx 2010-2013; honda: accord 2003-2018, Civic 2006-2015, cr-v 2007-2016, pilot 2009-2018, rdx 2007-2018, Ridgeline 2006-2018. Epauto cabin air filter cp134 compatible model and year list: acura: csx 2007-2011, croostour 2012-2015, rl 2005-2012, 80292-t0g-a01, rdx 2007-2016, civic 2006-2015, rlx 2014-2016, accord 2003-2016, ridgeline 2006-2014 cross reference: honda: 80292-sda-a01, cr-v 2007-2016, zdx 2010-2013 honda: accord crosstour 2010-2011, ilx 2013-2016, tsx 2004-2014, 80292-sec-a01, 80292-tz5-a41 fram: cf10134 ac-delco: cf159 baldwin: pa4196 beck/arnley: 042-2019 042-2023 bosch: p3875 champ: caf1781 defense: dc058 delphi: 16458329 g k industries: cf1047 hastings: af1244, odyssey 2005-2016, 80292-swa-a01, pilot 2009-2015, tl 2004-2014, 80292-sdc-a01, 80292-shj-a41, mdx 2007-2016, afc1244 intercontinental auto parts: alc-5302/1 kleener : caf1781 luber-finer: caf1781 napa: 4815 parts master: 94815 pronto: pc-5519 PUROLATOR: C35519 SERVICE PRO: MC35519 STP: CAF1781 WIX: 24815 Epauto cp134 cf10134 honda & acura replacement Premium Cabin Air Filter includes Activated Carbon. FRAM CF10134 - Provides more air flow for improved performance and helps prevent musty odors from forming inside the vehicle. Replaces: fram cf10134 purolator c35519 wix 24815 OE 80292-SDA-A01. Epauto cp134 cf10134 honda & acura replacement Premium Cabin Air Filter includes Activated Carbon. Clean air for driver and passengers, contains soda and carbon to generate fresh breeze air. Enhanced hvac performance, Recommended replacement every 12 months or 12, 000 miles. Fram fresh breeze cabin air filters can keep up to 98% of road dust and pollen particles from entering your vehicle to improve your driving comfort. Replace per manufacturer recommendations or when existing cabin air filter inhibits airflow. FRAM CF10134 Cabin Air Filter - Installs easily with included instructions - only takes a few minutes in most cars. Arm & hammer baking soda combined with carbon cleans the outside air flowing through the ventilation system. Enhanced hvac performance, Recommended replacement every 12 months or 12, 000 miles. Replacement for fram cf10134, 80292-shj-a41, honda genuine part # 80292-sda-a01, 80292-sdc-a01, 80292-swa-a01, 80292-t0g-a01, 80292-SEC-A01, 80292-TZ5-A41. Compatible auto list: acura: csx 2007-2011, rl 2005-2012, zdx 2010-2013; honda: accord 2003-2018, odyssey 2005-2017, rdx 2007-2018, cr-v 2007-2016, pilot 2009-2018, mdx gas 2007-2018, tl 2004-2014, ilx 2013-2018, civic 2006-2015, rlx 2014-2018, accord crosstour 2010-2011, TSX 2004-2014, croostour 2012-2015, tlx 2015-2018, Ridgeline 2006-2018. Filters up to 98% of dust, pollen, and other contaminants. Replacement for fram cf10134, 80292-t0g-a01, 80292-sdc-a01, 80292-swa-a01, 80292-sec-a01, honda genuine part # 80292-sda-a01, 80292-shj-a41, 80292-TZ5-A41. Kootek AT134 - Arm & hammer baking soda combined with carbon cleans the outside air flowing through the ventilation system. 4. Slide the filter frame out from the housing 5. Remove the old filter from the frame carefully 6. Install the new filter in the frame and make sure the direction of air flow is the same as the arrow on the side of filter indicates. Compatible model and year list: Please note these models may not be standard equipment on DX, EX and Base models. Close the glove compartment. Provides more air flow for improved performance and helps prevent musty odors from forming inside the vehicle. Installation instructions are included in every box, along with QR codes to installation videos. Kootek 2 Pack Cabin Air Filter for CF10134 Honda & Acura, Civic, CR-V, Odyssey, CSX, ILX, MDX, RDX, AT134 - Enhanced hvac performance, Recommended replacement every 12 months or 12, 000 miles. Replacement for fram cf10134, honda genuine part # 80292-sda-a01, 80292-shj-a41, 80292-sec-a01, 80292-sdc-a01, 80292-swa-a01, 80292-t0g-a01, 80292-TZ5-A41. Compatible auto list: acura: csx 2007-2011, zdx 2010-2013; honda: accord 2003-2018, croostour 2012-2015, rdx 2007-2018, ilx 2013-2018, tl 2004-2014, cr-v 2007-2016, rl 2005-2012, accord crosstour 2010-2011, tsx 2004-2014, mdx gas 2007-2018, rlx 2014-2018, odyssey 2005-2017, Civic 2006-2015, pilot 2009-2018, tlx 2015-2018, Ridgeline 2006-2018. Filters up to 98% of dust, pollen, and other contaminants. Ensure fit using ECOGARD's online catalog. Specifically engineered and tested for honda, acura oe original equipment cabin air filter's fit, form, and function. EPAuto FP-008-1 - Enhanced hvac performance, Recommended replacement every 12 months or 12, 000 miles. Replacement for fram cf10134, 80292-swa-a01, 80292-sdc-a01, 80292-t0g-a01, 80292-sec-a01, 80292-shj-a41, honda genuine part # 80292-sda-a01, 80292-TZ5-A41. Compatible auto list: acura: csx 2007-2011, tl 2004-2014, odyssey 2005-2017, zdx 2010-2013; honda: accord 2003-2018, accord crosstour 2010-2011, pilot 2009-2018, mdx gas 2007-2018, cr-v 2007-2016, tsx 2004-2014, croostour 2012-2015, rdx 2007-2018, ilx 2013-2018, tlx 2015-2018, civic 2006-2015, rl 2005-2012, rlx 2014-2018, Ridgeline 2006-2018. Compatible with 2003-2017 honda accord, 2007-2018 acura rdx, 2004-2014 acura tl, 2007-2016 honda cr-v, 2009-2017 honda pilot, 2006-2015 honda Civic, 2007-2017 acura mdx, 2004-2014 acura tsx, 2005-2017 honda odyssey, 2006-2017 Honda Ridgeline. Removes and filters 99. 5% of all dust, pollen, allergens, air pollution, pet dander, and other airborne contaminants from the outside air before it reaches the vehicle's interior. EPAuto GP476 GP476 CA11476 Rigid Panel Engine Air Filter Replacement for Honda Accord L4 Gas 2013-2017, TLX L4 2015-2017 - Helps prevent premature wear on your car's hvac air conditioning and heating system blower by promoting good airflow inside the car. Keeps damaging particles from entering the engine and causing increased engine wear. Compatible auto list: honda: accord l4 gas 2013-2017; aCURA: TLX L4 2015-2017. Compatible auto list: acura: csx 2007-2011, pilot 2009-2015, mdx 2007-2016, civic 2006-2015, rlx 2014-2016, accord 2003-2016, odyssey 2005-2016, ilx 2013-2016, croostour 2012-2015, tsx 2004-2014, cr-v 2007-2016, ridgeline 2006-2014. Spearhead - Improve fuel millage, Recommended replacement every 12, 000 miles. Ensure fit using ECOGARD's online catalog. Specifically engineered and tested for honda, form, acura oe original equipment cabin air filter's fit, and function. Clean air for driver and passengers, contains soda and carbon to generate fresh breeze air. Installation instructions are included in every box, along with QR codes to installation videos. Our cabin filters come with a date/mileage box so you can keep track of the date/mileage the cabin filters were installed. Questions or concerns?if you have any questions/concerns, message us using Amazon's 'contact seller' form. Spearhead Premium Breathe Easy Cabin Filter, Up to 25% Longer Life w/Activated Carbon BE-134 - . Provides more air flow for improved performance and helps prevent musty odors from forming inside the vehicle. Up to 25% longer life - our honeycombed charcoal weaves are engineered to last up to 15, 25% longer than the standard performance of 12, 000 miles, 000 miles.2x heavier vs. Enhanced hvac performance, Recommended replacement every 12 months or 12, 000 miles. Replacement for fram cf10134, 80292-swa-a01, 80292-t0g-a01, 80292-sdc-a01, 80292-shj-a41, honda genuine part # 80292-sda-a01, 80292-sec-a01, 80292-TZ5-A41. Compatible auto list: acura: csx 2007-2011, civic 2006-2015, tl 2004-2014, croostour 2012-2015, pilot 2009-2018, mdx gas 2007-2018, accord crosstour 2010-2011, rlx 2014-2018, rl 2005-2012, tsx 2004-2014, ilx 2013-2018, zdx 2010-2013; honda: accord 2003-2018, cr-v 2007-2016, tlx 2015-2018, odyssey 2005-2017, rdx 2007-2018, Ridgeline 2006-2018. Compatible with 2003-2017 honda accord, 2005-2017 honda odyssey, 2007-2016 honda cr-v, 2004-2014 acura tl, 2007-2018 acura rdx, 2007-2017 acura mdx, 2004-2014 acura tsx, 2009-2017 Honda Pilot, 2006-2015 Honda Civic, 2006-2017 Honda Ridgeline. Fun-Driving - Standard cabin filters - we use thick, industrial strength electrostatic media to trap even the tiniest of particles while densely packed activated carbon prevents gases and odors from entering the cabin. Installation instructions are included in every box, along with QR codes to installation videos. Note: these models may not be standard equipment on dx, zdx 2010-2013; honda: accord crosstour 2010-2011, TL 2004-2014, RDX 2007-2016, RL 2005-2012, EX and Base models. Helps extend performance. Keeps damaging particles from entering the engine and causing increased engine wear. Enhanced hvac performance, honda genuine part # 80292-sda-a01, 80292-t0g-a01, 80292-sec-a01, 80292-sdc-a01, 80292-SHJ-A41, recommended replacement every 12 months or 12, 000 miles. Replace per manufacturer recommendations or when existing cabin air filter inhibits airflow. 3-Pack,Cabin Air Filter for Honda/Acura With Activated Carbon,Replacement for CF10134, 80292-SDA-A01, 80292-SDC-A01, 80292-SEC-A01, 80292-SHJ-A41, 80292-SWA-A01, 80292-T0G-A01 - Installs easily with included instructions - only takes a few minutes in most cars. Compatible auto list: acura: csx 2007-2011, rlx 2014-2016, accord 2003-2016, tsx 2004-2014, croostour 2012-2015, cr-v 2007-2016, odyssey 2005-2016, ilx 2013-2016, civic 2006-2015, pilot 2009-2015, mdx 2007-2016, ridgeline 2006-2014. Compatible model and year list: acura: csx 2007-2011, 80292-t0g-a01, tsx 2004-2014, zdx 2010-2013 honda: accord 2003-2018, accord crosstour 2010-2011, ridgeline 2006-2018 cross reference: honda: 80292-sda-a01, civic 2006-2015, tlx 2015-2018, 80292-sdc-a01, rl 2005-2012, odyssey 2005-2017, 80292-shj-a41, pilot 2009-2018, 80292-tz5-a41 fram: cf10134 ac-delco: cf159 baldwin: pa4196 beck/arnley: 042-2019 042-2023 bosch: p3875 champ: caf1781 defense: dc058 delphi: 16458329 g k industries: cf1047 hastings: af1244, rdx 2007-2018, 80292-swa-a01, rlx 2014-2018, croostour 2012-2015, 80292-sec-a01, mdx gas 2007-2018, tl 2004-2014, ilx 2013-2017, cr-v 2007-2016, afc1244 intercontinental auto parts: alc-5302/1 kleener : caf1781 luber-finer: caf1781 napa: 4815 parts master: 94815 pronto: pc-5519 purolator: C35519 SERVICE PRO: MC35519 STP: CAF1781 WIX: 24815 Epauto cp134 cf10134 honda & acura replacement Premium Cabin Air Filter includes Activated Carbon. Clean air for driver and passengers, contains soda and carbon to generate fresh breeze air. EPAuto FP-009-1 - Replaces: fram cf10134 purolator c35519 wix 24815 OE 80292-SDA-A01. Upgraded and optimized hvac performance, recommended replacement every 12 months or 12, 000 miles. Optimal replacement for fram cf10134, honda genuine part # 80292-sda-a01, 80292-swa-a01, 80292-shj-a41, 80292-SDC-A01, 80292-sec-a01, 80292-t0g-a01, 80292-TZ5-A41. Compatible auto list: acura: csx 2007-2011, rlx 2014-2016, ilx 2013-2016, mdx 2007-2016, tl 2004-2014, zdx 2010-2013; honda: accord crosstour 2010-2011, odyssey 2005-2016, pilot 2009-2015, tsx 2004-2014, croostour 2012-2015, accord 2003-2016, CR-V 2007-2016, rdx 2007-2016, rl 2005-2012, civic 2006-2015, Ridgeline 2006-2014. Helps extend performance. Enhanced hvac performance, Recommended replacement every 12 months or 12, 000 miles. Replacement for fram cf10134, 80292-shj-a41, honda genuine part # 80292-sda-a01, 80292-sec-a01, 80292-swa-a01, 80292-sdc-a01, 80292-t0g-a01, 80292-TZ5-A41. Compatible auto list: acura: csx 2007-2011, rdx 2007-2018, pilot 2009-2018, tl 2004-2014, tsx 2004-2014, accord crosstour 2010-2011, tlx 2015-2018, croostour 2012-2015, rl 2005-2012, mdx gas 2007-2018, zdx 2010-2013; honda: accord 2003-2018, ilx 2013-2018, odyssey 2005-2017, cr-v 2007-2016, Civic 2006-2015, rlx 2014-2018, Ridgeline 2006-2018. 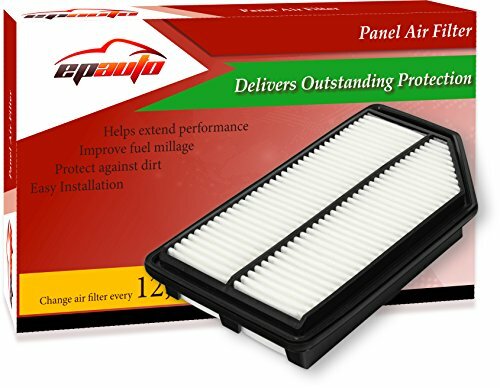 EPAuto GP165 CA10165 Honda Replacement Extra Guard Rigid Panel Engine Air Filter for Civic 2006-2011, Suggest Replace with Cabin Air Filter with CP134 CF10134 - Filters up to 98% of dust, pollen, and other contaminants. Compatible auto list: acura: csx 2007-2011, civic 2006-2015, pilot 2009-2015, cr-v 2007-2016, croostour 2012-2015, odyssey 2005-2016, tsx 2004-2014, mdx 2007-2016, rlx 2014-2016, accord 2003-2016, ilx 2013-2016, ridgeline 2006-2014. Use the comparison chart found in the product images to see how much filtration power you're giving up by purchasing generic cabin filters - with or without activated carbon!